Last month I had a friend from church approach me, and asked, “Have you ever heard of Republic Wireless?” He went on to say they offer the Moto X phone and a plan at just $25 per month. It really caught my attention, seemed like a great option and included unlimited texting/data. I had to try it out and see if this wireless provider was all that my friend had touted it to be. In walking through the website and signing up for phone and service I was immediately caught by how easy to use and clean that the website was presented. With a lot of these discount cell phone service providers, you often find the website and ordering process cumbersome. Not Republic Wireless! Since I’ve had the phone over the past month, I’ve had plenty of time to see the pros and cons, and weigh it against the other cell phone services I’ve reviewed (Virgin Mobile Review and Walmart Family Mobile Review) and currently use. Here are few of the key features of the phone and its services. 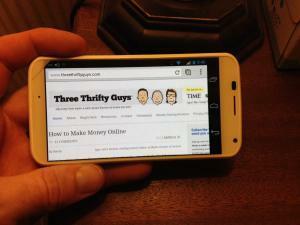 Price and Money savings – currently Republic Wireless offers the Moto X phone for $299 with no contract. Along with the phone they offer four different plans, but I took advantage of the $25/month plan. Amortized over the course of a year the phone and service end up costing about $50/month and if you keep the phone for two years, then it drives the cost down to $37.50/month. When compared to the basic data and cell coverage from Verizon or AT&T, Republic Wireless offers a saving of $30-50/month, which is quite significant. Usage of wifi from home – the way that Republic Wireless is able to offer such cheap service on their services is that their phone will utilize your home WiFi internet connection for both data and cell calls. This way they won’t be using their cell towers to provide you these services. In reading some other reviews prior to purchasing the phone I discovered that people got disconnected or degraded phone service when they backed out of their garage and headed down the road. The reason being that the phone has to make a smooth transition off your home wifi and use their cell towers. I tried this out the first day I had the phone, and had no problems at all. It truly is amazing how the phone can transition off your wifi and not miss a beat in moving to cell phone coverage. Coverage map – Republic Wireless primarily uses the Sprint network towers and will utilize the Verizon towers when a Sprint network tower isn’t available. In traveling back to our farm in Northwest Iowa I was most impressed with their data and phone coverage no matter where I was at! I’ve test out a number of other cell providers and none of the discount providers offered anything close to the Republic Wireless coverage! For that I give them a big five star rating. However, when I was “roaming” on the Verizon cell towers I did notice I had significantly degraded bandwidth compared to my wife’s Verizon iPhone. I even used my Ookla Speedtest analyzer and got about .12 Mbps down and .10 Mbps up while roaming. I have to assume that when you are roaming that you are put on the lowest priority with the Verizon towers to keep costs down. So be keenly aware of their roaming areas before purchasing the phone. 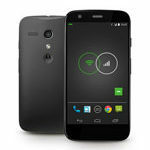 Ease of use – all cells phones should be as easy to use as the Moto X on Republic Wireless. Within 15 minutes of receiving the phone in the mail, I had cell, data, and texting functioning. How come every time I go into a Verizon or AT&T store it feels like it takes them an hour to get my entire phone setup? Not this phone! On top of that, the OS functions flawlessly, and I have had no errors or problems in using any app on the phone. The phone is so intuitive that even my 90 year old Grandma could use it! Final thoughts: I love Republic Wireless! I do! I’m not ashamed to say it in public either. This is one of those products that I’ll tell all my friends and family about, because I’v been so impressed. Plus, I’m not getting paid to write this review, but this is just my opinion. I’ve been so impressed with the service, coverage and functionality of the phone that I’m planning on switching from my cheap (pay-as-you-go) phone service over to Republic Wireless. Next week I’m planning on porting over my old phone number. Honestly, if you are using any of the major cell carrier services, then you need to look at Republic Wireless as a much better and cheaper option. Don’t take my word for it, but try out the phone for the 30 day trial for yourself. I’d be interested to hear from our readers on 1) how much do you pay per month for your cell services, and 2) what features data, texting, etc, do you get under your existing plan? It has now been three years since I purchased the Moto X (first generation) from Republic Wireless, and boy has it been a great journey. I first switched to Republic Wireless, because a fellow church member had recommended it to me. At the time I was paying $10/month for a QWERTY Trac phone that didn’t give me many bells and whistles. In February 2014, I was a little hesitant about dishing out $300 for the upfront costs of the phone, but I knew if I amortized the costs of the phone over its life then it wouldn’t cost that much. Fast forward three years, and here is a breakdown of how much the Republic Wireless 2GB plan and the Moto X have costed me. Not too bad for getting my first smart phone and with a great data package. When I compare this to my wife’s Verizon 2 GB plan, Unlimited Text, and 450 minute iPhone 6, then her average costs are about $92/month. The Republic Wireless plan is saving me over half of what the traditional AT&T, Sprint, and Verizon plans. As with anything that are a lot of positives and negatives that have come with the Moto X Republic Wireless plan over the last three years. Extremely Reasonable Price – for 2GB of data, unlimited text and talk for $40/month over the life of the phone is really hard to beat. I think their plans are some of the best in the industry and they are continuing to work to keep costs low for their consumers. Durability – I bought an $8 protective cover when I bought the phone, and the phone has resisted cracks and scraps very well. A+ on the design and ability to withstand the pound that me and my kids have put on this phone! Battery Life – this phone’s battery life would hold a charge for the entire day of use for the first two years. Not bad for an Android phone. Coverage Area – probably the only big downside I have to mention about the phone and plan is their coverage. Since the Republic Wireless plan rides the Sprint network, I lose cell coverage whenever I go home to my folk’s farm in Northwest Iowa. This entire region is covered by Verizon and US Cellular and no one else. So I highly encourage you to look at the coverage map before purchasing the phone and making sure you have coverage near your primary residence, and where you typically travel. In my case I don’t go home that often, so cell coverage isn’t a big deal for saving the extra money each month. Battery Life – after the two year mark of owning the Moto X, then my battery life has quickly dwindled. I can only get about 5-7 hours of life out of it now. I have to shutoff my phone during the day when I’m not using it, which isn’t a big deal, but kind of an inconvenience. I am in the process of purchasing a battery replacement kit, and will post a video and blog post in April on how to do that. Check back for updates on how to replace your Moto X (first generation) battery. Update 12/12/17: Republic Wireless just lowered their prices. “My Choice” plan starts at just $15 for unlimited calls and texts and allows customers to add gigabytes of cellular data as needed for just $5 per GB. Update 5/12/18: For a limited time, sign up for Republic Wireless’ Educator Appreciation Program using a valid school email address to receive a 50% discount on our My Choice Plan. This discount will be applied through at least May 31, 2020, giving you real savings that you can spend on the people and experiences that matter most to you. Update 6/1/18: Sign up for Republic Wireless and they’ll foot the bill for the first 3 months of your cell phone service this summer when you sign up for the unlimited talk and text plus 1GB plan with a phone you purchase from Republic Wireless. Taxes / fees apply. I’ve been using Republic for a few years now, I’m on the plan with unlimited text/calls but only WiFi data for $12/month and am still using the gen1 MotoX. This has been a great program for me. I travel out of the country a bit, and as long as I have WiFi I can call back home. The only problem I’ve had is the battery getting old in my phone, I replaced it for less than $10 and I’m back to full life again. I have had this service for over four years and it started out as being ok. Like most people, my phone service is important to me for business and personal use. Be aware that there is NO PHONE SUPPORT. It is strictly by email…….make no mistake, NOT BY CHAT, BY EMAIL. This means that you need to open a ticket for an issue then wait for a tech to email you back with HOPEFULLY a fix. In the beginning, return emails and the quality of the techs was for the most part adequate. The quality of the techs and the time waiting for an email response has SERIOUSLY DEGENERATED. I have had issues that have taken 8-12 emails back and forth and some issues have been resolved and some have not. These issues took DAYS AND DAYS to resolve NOT hours. Last straw was a NO SERVICE issue. I had NO PHONE SERVICE AT ALL and from the time I opened a ticket online it took 48 hours for the FIRST response from Republic!! After 12 emails back and forth ( over a period of DAYS!!) with no resolve, I did my own research online and fixed it myself. The whole operation is like Sesame Street!! You will get notices to evaluate the service with JUVENILE smiley face or frowny face imogies ( DDDUHHHHHHHHH) and response emails immediately responding ” WE ARE SO SORRY”/”WE APOLOGISE”/ and more juvenile smiley faces. All and all, this service is now WORTHLESS. I will be changing service providers in the next couple of days. I would not stay if the service was FREE!! Don’t be fooled by some of the positive feedback. Most are written by folks that have a just signed up and are not yet aware of the serious deficiencies relating to this service. BEWARE!!! This company is on it’s way out!! Thanks for sharing your experience with RW, Al. Charlie hasn’t had these issues with them in his 3 years with the company – but everyone’s experience is unique. Al – I’ve been with Republic Wireless for over three years and have had no issues. The biggest thing you need to make sure of is that you have adequate coverage in your area before you purchase RW. That will probably be your biggest factor in whether you like the service or not! Thanks for leaving a comment! Hey George. A lot of their support questions are / can be answered by active forum members / customer service reps. But, you’re right they don’t have the traditional support many are accustomed to. I’ve heard some great things about Republic and am taking my first step into getting my own network (coming out from under my son in law’s sprint account. Looking into the Moto E4 and need some opinions! I’m a much older woman, not technically savvy and need something I can use with ease. Thank you for your help. Hi Frani. RW is a good option. But, you may also be interested in Ting, Tello or even TracFone (all similar to RW in that they are MVNO’s – but could be cheaper). It all really depends on your needs. You should note that Republic Wireless uses CDMA Network or GSM. And if you go out of one network it wouldn’t switch to the other network. Unlike Twigby which uses two networks and if you go out of the primary provider network, it automatically switches to the secondary but only talk and text. Republic was one that I was looking at a while ago, but unfortunately, I have no home internet so my phone is all I have. (just couldn’t stand AT&T’s lousy service any more) I’ve been very happy with my Pre-paid, no contract, Metro PCS. About 9 months ago I got a Samsung J7 for about $100 with promotional discounts and $60 a month for unlimited everything, which I definitely need, with 6G of hotspot. It works for me. For anyone that doesn’t have internet and needs the unlimited, I would highly recommend it. I’ve been using RW for several years now, I love them. A few things to mention, one you can now bring your own phone when you switch. Don’t know how that works switched from Virgin to RW. The ability to change plans up to twice a month is helpful, but I find the ability to buy extra data if I need it something I use in emergency instances. Also my current plan does rebate me unused data. Last month’s bill of $25.00 was actually $18.12, which is actually high for me. Most months I average around $15.00. Now I do live in a heavily populated wifi rich environment, so your actual bill may vary. Nice! I considered Republic when I switched away from Verizon, but I wasn’t a fan of the phone choices. I opted for Google Fi, which has more flexibility while you’re traveling. I also like the data rebates, so I only pay for the data I actually use. Over time you really can save money this way. One of the factors that you do not discuss is the capability to modify programs twice monthly at no fee. I have used this a few periods when going on visits so that I would have mobile information on my cellphone, which is very useful of course, while not having to pay for it all time. Thanks. I really hope that my wife and I can switch over to Republic Wireless after our contracts expire at the end of the year. It sounds like a really great deal. I’ve been a Republic Wireless customer since mid-January and, like others who have already commented, I’m very satisfied so far. 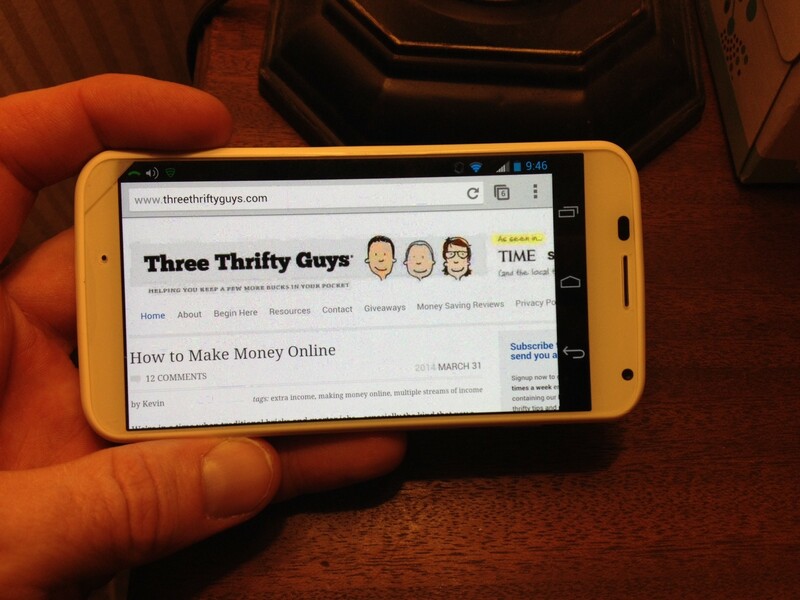 I have the Moto X and find it to be a great, well-rounded phone. I’m on the $40/month 4G, unlimited everything plan (the highest available). When I’m outside of my home WiFi zone, it defaults to 3G for now, but that is supposed to change this month when Sprint upgrades their towers in this area (I’m in NW Ohio). I’ve traveled to south Michigan and a certain part of Toledo, where I’ve experienced 4G, and it’s very fast. This is an efficient phone that doesn’t drag or freeze like my previous smart phone did. I came on board because of my brother’s strong recommendation. We both took advantage of another benefit through Republic Wireless. Because he referred me, he received a free month of service, and I also received a discount equal to the amount that he received. The only feature that my previous phone had, which this one doesn’t, was the ability to set an alarm, turn the phone off for the night, and still have it go off in the morning. That’s a very small thing, though. Otherwise, I have nothing but positive things to say about it. Is this phone a smart phone? Hi Adria. This is a smartphone, yes. Dwight – I forgot to mention the battery life in my post. Ya I agree! The battery life is exceptional. I have been a Republic Wireless subscriber for five months now(Verizon before that) and am happy in making the switch. I am not very tech savy so I was a little bit apprehensive; in fact, when I made the move to the service and with Moto X phone I had still been using a flip phone! With encouragement from family I made the switch. I have the $25 dollar plan and with tax my monthly bill has been $29.16; it is a $17/ month savings from my old plan and that was with no data! I highly recomment Republic. $29.16/month isn’t a bad deal for a smart phone with data! I agree it is a good option vs paying $84/month on Verizon. I’ve been on Republic for over 4 months now and I have not been disappointed. When I switched from Verizon I went all-in and went with the $10, no cellular data, plan and while my usage patterns have had to change it fits with my lifestyle just fine. With so much of my life spent at home and at work, both of which are covered in Wifi, I very rarely end up needing to use cellular data. One of the things that you don’t mention is the ability to change plans twice a month at no fee. I have used this a few times when going on trips so that I would have cellular data on my phone, which is very handy of course, while not having to pay for it all the time. I would encourage anybody who is thinking about switching to look at their usage patterns and how much of their life is spent under wifi coverage. If you are like me you could save a bit more money every month while still having the ability to “activate” cellular data in your back pocket. Great review. I thought I would leave a couple notes that might clarify some of your observations…. For one, the roaming speeds you observe are due to the fact that you are roaming in 2G or in the CDMA world, it’s called 1xRTT. 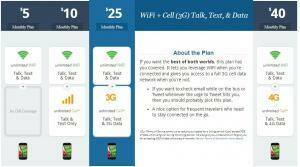 Sprint’s roaming agreements (and thus Republic Wireless) restrict phones to 2G on all roaming carriers. Also, Sprint/Republic Wireless roam on more than Verizon. They also use other CDMA carriers like US Cellular. If you are a ‘native’ Sprint customer, when you roam, you will also be limited to 2G (I know this since I still am a Sprint customer but am considering Republic Wireless). The other thing to note is that you are very limited in your data cap when you roam (both on Sprint as well as on Republic Wireless). I believe it’s only in the 100’s of MB per month but at 2G speeds, it would take a while to exceed those numbers). Republic Wireless is superior to other Sprint MVNO’s like Virgin Mobile and even Boost Mobile in that those carriers don’t allow roaming off the Sprint Network. The other enticing thing is they are releasing the Moto G this month for 1/2 the price of the Moto X so that can be a very affordable option for people who just need basic Smartphone service. Paul – EXCELLENT feedback! This is probably one of the most detailed and thorough comments I’ve ever received in our three years of writing this blog! Thanks for reading.